Microarray technology has established itself as the central platform for functional genomics, with DNA oligonucleotide arrays the preferred method for large-scale expression measurement. Such expression data are needed to complement the increasing availability of EST and genome sequence information from many organisms. Expression levels in a number of different tissues or situations provide a first step toward a functional characterisation of new entities revealed by DNA sequencing. DNA microarray analysis is based on a hybridisation technique in which DNA fragments or oligonucleotides, corresponding to different genes or complementary DNA (cDNA) molecules, are immobilised on a solid support in an fixed and ordered layout. Mixtures of DNA or RNA isolated from biological sources are labeled enzymatically by the incorporation of nucleotides bearing fluorescent reporter tags. The labeled solution is hybridised to the complementary sequences (probes) on the chip surface. Since each probe element is chemically homogeneous and occupies a known location, the identity and quantity of each component in the fluorescent mixture can be ascertained by measuring the fluorescence intensity at each position in the array. To avoid confusion, the terminology used is “probe” for the known printed DNA fragments immobilised on the solid support and “target” for the unknown fluorescently labeled DNA that is to hybridise with the probes. Since July 2002, the ACGT Microarray Facility has been providing a core service to biological researchers in South Africa. Managed by the ACGT, the Microarray Facility is located in the laboratory of Professor Dave Berger of the Department of Plant Science at the University of Pretoria, while the operation and technical maintenance is the responsibility of Nicky Olivier. This facility also forms a functional part of the Forestry and Agricultural Biotechnology Institute (FABI). The ACGT Microarray Facility has supported projects undertaken by scientists from all over South Africa and even beyond our borders. Most researchers using the Facility are from partner institutions of the ACGT, i.e. the University of Pretoria, the CSIR, the University of the Witwatersrand and the University of Johannesburg. Projects in these institutions mostly focus on genotyping, expression analyses and diagnostics in plants (Arabidopsis, Eucalyptus, cereals and banana), as well as various fungal species. Medical studies are in progress at the Medical Schools of the University of Pretoria, the University of the Witwatersrand and the University of KwaZulu Natal, while Veterinary Departments making use of the facility include the Veterinary Faculty at Onderstepoort and the International Livestock Research Institute (ILRI) in Nairobi, Kenya. While many of the current projects are plant-related, the Facility is open to researchers from any field of biological science, both locally and abroad. 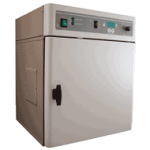 The major equipment available in the ACGT Microarray Facility includes a Molecular Dynamics Generation III Spotter, Molecular Devices Genpix 400B Scanner and Agilent Hybridisation Oven. The Generation III Spotter from Molecular Dynamics is used for printing custom microarray slides. The print head consists of 12 stainless steel capillary pens that each load about 200nl of sample at a time. This is allows the printing of 36 slides in duplicate without having to reload from the sample plate. A maximum of 10 368 unique spots can be printed per slide (from 27 x 384-well spotting plates) or 4 992 samples printed in duplicate (13 x 384-well spotting plates). The Molecular Devices 4000B scanner with GenePix Pro 6 software is used for the imaging and quantification of the hybridisation results. It has dual lasers and filters for detecting emission wavelengths at 532nm (Cy3) and 635nm (Cy5) in one scan, with resolution down to 5μm. 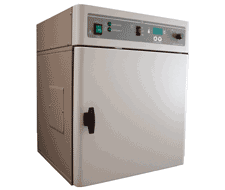 Th e Agilent Hybridization Oven and Agilent Hybridization Chambers are used with glass slides. Specific backing slides can compartmentalize different samples onto the number of arrays present on the slides. This is especially useful for Agilent arrays which can contain up to 8 distinct arrays on one slide. Since there is a single area backing slide version available, single area spotted array hybridizations can also be processed using this system. When assembled correctly the slide/backing slide contains an air bubble that mixes the hybridization solution during rotation in the Hybridization Oven, ensuring more efficient and even hybridizations. A locally manufactured hybridisation chamber, referred to as the Hyb-up (pictured here), is used for performing static hybridizations in a water bath. At present the Facility does not offer a hybridisation service and this should either be carried out in each investigator’s laboratory, or the Facility provides lab space and access to equipment for interested researchers. In partnership with BioPAD and the Bioinformatics and Computational Biology Unit of the University of Pretoria, the Facility established expertise in the analysis of microarray expression data using the limma software component of the freely available R Bioconductor package. A statistician is available to assist with experimental design and the evaluation of the statistical significance of proposed studies. In 2005 and 2006 the Facility, in partnership with BioPAD, presented Microarray Laboratory Workshops to provide interested researchers with experience in the experimental design, practical laboratory protocols and data analysis of microarray experiments. A less intensive laboratory course for a limited number of participants (called the Starter Kit) is presented at irregular intervals, but has the same aim in mind as the BioPAD subsidized workshops. In addition, the Facility presents an annual course in data analysis to researchers with some experience with microarrays and who might have data to analyze. This workshop gives a more intensive exposure to data analysis using the limma software package, but also covers clustering and data management issues amongst others.